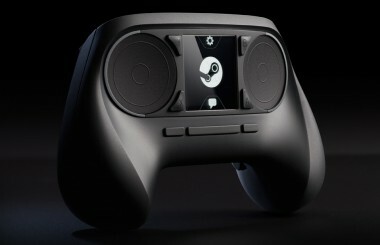 Today, Valve revealed the final piece for its plans to bring PC gaming to the living room: A game controller. The Steam Controller is shaped like a traditional controller but features two circular, clickable trackpads instead of analog sticks. Valve said that the trackpads allow for “far higher fidelity input” and come close to the experience and precision offered by a desktop mouse. In addition, the trackpads are equipped with small electromagnets that provide haptic feedback. Between the two trackpads is a touchscreen that can also serve as a single, clickable button. Using Valve’s API, developers can build their games to use the touchscreen as a scrolling menu, a radial dial or a secondary screen. Valve also said that actions prompted by the controller’s touchscreen will be overlaid onto the game, so players don’t have to look back and forth between their TV and the controller. The Steam Controller has 16 buttons total, and the location of each control is based on frequency of use, precision required and ergonomics. Built from the ground up, the Steam Controller has been in the works at Valve for about a year. The idea behind it was to make games that were playable only with a keyboard and mouse accessible from the sofa. The Steam Controller will work with any game available on Steam. Users can sign up to be a beta hardware tester, though Valve warns that the beta units will not have touchscreens or be wireless. The API will be made available to developers when the company ships its first prototype controllers later this year. The Steam Controller marks the last of three announcements made by Valve this week. Earlier, the company announced its Linux-based SteamOS and Steam Machines game consoles. All are aimed to expand PC gaming to the living room, and though Steam Machines may not be “console killers,” they could disrupt the PC market. Next week, Valve promises to reveal more details about its SteamOS prototype.